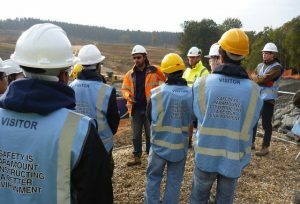 A group of our Civil Engineering students visited the site of a flood prevention scheme in West Sussex to gain an insight into what collaborative engineering looks like. The visit to Clay’s Lake was organised with Mackley and was designed to help students develop their understanding of how theory works in practice. David Knapp, Mackley’s Business Development Manager, said: “This is the second group of students to visit Clay’s Lake and both parties have been a credit to the University of Brighton. You can find out more about the visit here. Or contact Dr Maria Diakoumi (M.Diakoumi@brighton.ac.uk) for more information. This entry was posted in Civil engineering, Field trips, Life at Brighton, Site visits, Uncategorized.